This photo is a sliver of the main counter and repair bay. 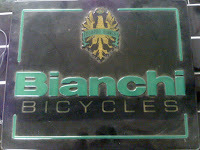 Simplicity is a Bianchi Dealer and a dealer with a lot of heart. His wife has an old Bianchi from back in the day and still loves the bikes so much that when it was game time for Kirk, bringing Bianchi on board was an easy choice. From working at the previous shop, Kirk kept some of the Bianchi displays pieces. This is a classic lighted sign that we don't make anymore. Or at least one that looks like this one. And a banner too as shown behind the counter. 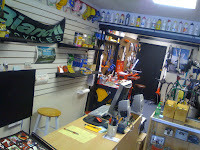 The shop has a nice Mom and Pop feel to it and is wonderfully decorated with cycling memorabilia from the 80s and 90s. Kirk has a sweet collection of old racing caps, helmets, water bottles and jerseys that just ooze class. But this isn't an elitist racer snob-shop. Kirk has what it takes to give you the best service and attention whether you're a CAT 1/2 or a Rail Trail-Commuter.